I came across this list last week, it's a nice reminder of some of the things that should be important to every small group leader. You can read the entire blog post here. The author, Jon Stolpe, expands on each of these points with his own thoughts: 1. Small group leaders are important. 2. Small group leaders set the tone. 3. Small groups are not about small group leaders. 3A. Small groups aren’t just about the groups either. 4. Small group leaders aren’t supposed to live on an island. 5. Small group leaders must be invitational. 6. Small group leaders aren’t perfect. 7. Being a small group leader isn’t always easy. 8. Seek advice and wisdom from trusted advisers. 9. 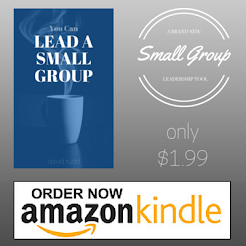 Lean into the small group leader community. 9A. Be patient. It may take time for your small group to grow. 10. Be passionate! One of my desires is that every small group to which I am connected will develop a missional strand in their DNA. In other words, I want them to exist for a purpose greater than just meeting together. Groups can become missional in many ways, but often it requires taking a few baby steps to get going. Here are some thoughts I came across yesterday which can be good first steps for a group that wants to be more externally-focused: 1. Find a single mom or single dad with whom your group can develop an ongoing relationship. 2. Have your group trained to provide respite care for foster families and volunteer to babysit for a local foster family. 3. Plan a group project to raise money to care for orphans. 4. Your group can throw a shower for a family adopting or fostering an older child. 5. Consider donating medical supplies, an appliance, or other items to an orphanage or women’s shelter as Christmas gifts. 6. Build a long-term relationship between your small group and a widow. I borrowed this article from Matt Lane. He has some good thoughts about making room for new relationships. Plus, I like legos! Last Wednesday during our small group we had a discussion about Legos. Yes those Legos. We took a break from our normal sermon based discussion to talk about why we meet and what we hope to accomplish. Our hope of course is that there is fruit from that main point but that is why we meet. Now to the lego part. 10. They are sometimes viewed as a threat by the pastor(s) of the church. 11. Home groups are often introduced in a programmatic, not a natural way. The following passages are not necessarily THE MOST important passages a small group leader needs to know, but each of them are useful for developing a leader's understanding of his or her group dynamic. I would recommend taking time to read and contemplate each of these passages, asking yourself the following questions: What does this passage teach me about the character and attributes of God? How should the character and attributes of our group be formed by this passage? Can I envision a specific instance in our group to which this passage might apply? Most small group Bible studies consist of anywhere from 12-20 questions. I think the rationale often is that you need a lot of questions in order to fill the group time. However, for my group tonight, we'll just be focusing on four simple questions. We've been together long enough that I know we can have a pretty robust discussion no matter how many questions we ask. Therefore, I tried to identify four simple questions that will enable us to unpack the texts we are looking at, as well as take the time to let them seep into our hearts. Hopefully, we'll all come away with something. I imagine our discussion will last about 45 minutes to 1 hour. If it's shorter, that's okay; we'll just use the time to pray. TiVo provides: unlimited opportunity to watch whatever i believe to be valuable whenever i desire to watch it. TiVo also provides a nice acrostic to describe what i perceive to be three critical factors that hinder volunteerism in the church. V -- Value -- most people have not bought into a vision/lifestyle that places a high value on church volunteerism. this is probably a greater reflection of our inability to sell a vision and build buzz than anything else. O -- Opportunity -- many people who might be willing to volunteer are not sure where they can, or worse yet, there are so many options they are not sure which one too choose, so they don't do any.